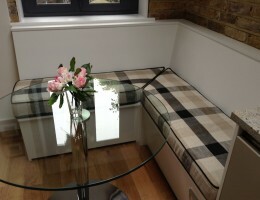 Window seat cushions, otherwise known as box cushions, can transform a room. 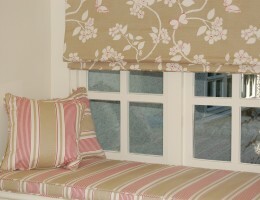 Diana Murray Interiors can provide bespoke window seat cushions and covers to your exact specification. Choice of a cartridge pleat heading makes the most of the checked design of this denim fabric and was an informal heading for a boy's bedroom. Full length, interlined curtains were made for two sets of windows in this bedroom. 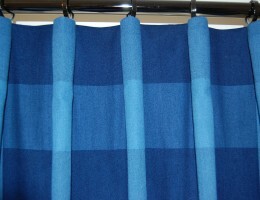 A triple pleat heading creates a lovely fold down the length of the curtain. A bespoke window seat overlooking the garden creates a relaxing place to unwind. 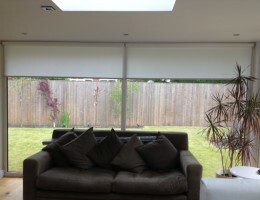 Diana Murray Interiors also made six roman blinds for this room. 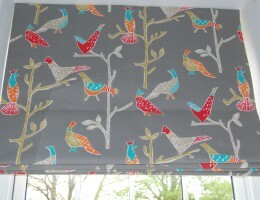 "Diana Murray is a curtain maker covering Epsom, Ashtead, Leatherhead, Surrey and South West London. 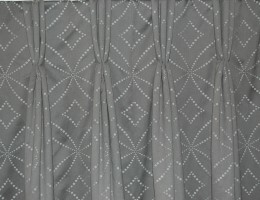 Our curtains, roman blinds and other soft furnishings are made to measure and hand stitched for the highest quality finish but at a competitive price. We provide a truly personal service to help you to transform your home.